The School of Dramatic Arts briefly caught up with alum Roland Buck III (BA ’15) for our Q&A series highlighting the accomplishments of the alumni of the USC School of Dramatic Arts. Roland Buck III is best known for his recurring role as Dr. Noah Sexton on NBC’s Chicago Med. 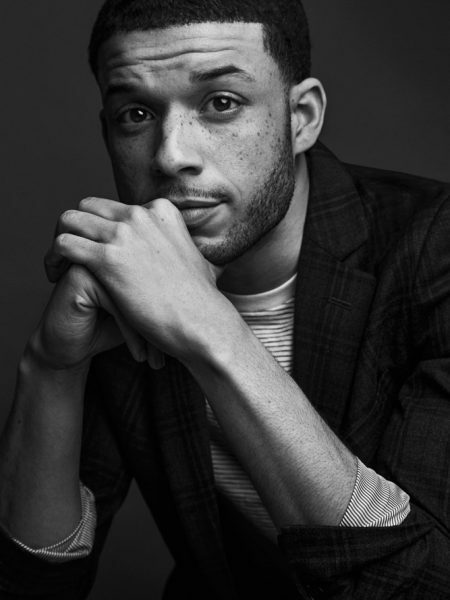 Named in 2017 as one of People Magazine‘s “Ones to Watch,” Buck recently starred alongside Adam Sandler and Chris Rock for the Netflix comedy The Week Of, in National Geographic’s award nominated mini series The Long Road Home and the film Sleight — which featured at the 2016 Sundance Film Festival. SDA: What was your best USC experience? Buck: I’d have to say the shows that I was in. I feel like I really fell in love with acting, like the entire process, while doing Arabian Nights my junior year. With all the rehearsal and prep then tech, the cast really bonded with each other. I felt like a little family, like playing a sport. They were my team. Buck: Yes, I remember sitting down with Tony Abatemarco for my midterm interview in intermediate acting. During that interview, I told him I was thinking about grad school after USC and wanted to audition for Yale or Juilliard. He asked me something that really stuck with me. He said, “Do you want to go to these schools because of the name or because you feel like you need it?” I said, “Well, I want to be the best and they have great programs.” He replied, “Yes, they do have great programs but by the time you graduate in a year, do you feel like you’ll benefit from staying in school another three to four years or will you be ready to work? Because there is only so much you can learn in a classroom. The rest you learn by doing.” He was so right! SDA: What do you miss about college, SDA specifically? Buck: Honestly, nothing really. Not that there was anything wrong, but I enjoy working. If anything, it would be the students, friends I made that I would spend so much time with. Buck: I was lucky enough to work on Arabian Nights, Getting Married, In the Blood & Senior Showcase. I also did 3 student films, 1 grad thesis: KarMa, Vicious and Stuck. Buck: Oh yea I do! I was a transfer student so I found out a littler later in because they wanted to see my spring semester grades first. But when I hadn’t heard anything back by June I started to get restless and just need to know yes or no. So, I went to the office of admissions and asked. I was so nervous while they were looking up my name but the lady told me right there that I got in! And asked if I had received anything in the mail? I said no, and when we looked at the address, they had the wrong one on file! They mailed out my admittance packet a month prior! She asked if I wanted to wait while she put a new packet together for me, I was like “Oh yea baby!” lol. SDA: What is your advice for current SDA students? Buck: Enjoy your time at school, be vulnerable and fearless in class so you can fall and grow everyday and HUSTLE. Build those hustling habits now so that it will be second nature for you to go get it when you’re out in the world on your own. SDA: What are you working on professionally? Buck: Currently, we are in the fourth season of Chicago Med in NBC. I also have a pilot executive produced by Channing Tatum called College that we are waiting to see if Amazon will order to series. Buck: That preparation equals separation. I never had a professor that took it easy on me if I wasn’t prepared and I’m glad because that set a foundation for me on all of my work. Prep eases my nerves and builds confidence for me. Casting directors and producers can tell you mean business when you show up like you’ve already won the job and it’s your first day on set.